BLE RTLS - Zone Method to know the real time position within a defined zone, of an item or person. Bluetooth Real Time Location System (RTLS – Zone Method) by BluEpyc. Nowadays, many technologies are used to make localization. With many years of experience in the RFID technology field, the BluEpyc R&D Department made many studies to adopt the best solutions, taking into account technologies costs, consumptions, accessibility, accuracy and application fields. 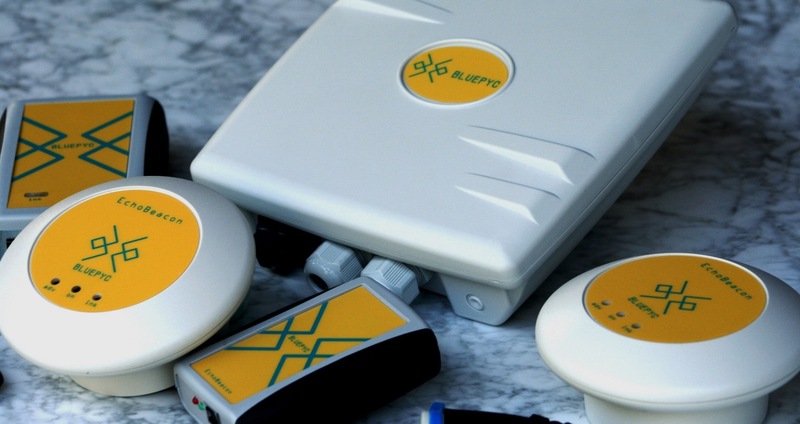 The result of such studies is Bluetooth Real Time Location System (RTLS – Zone Method) by BluEpyc. The Bluetooth Low Energy was confirmed to be the best technology to adopt, suitable for the latest IoT market needs and interoperability. Which technology to use for localization? The table below compares the main features that have to be considered in evaluate a technology, used for localization purposes. Advantages and disadvantages are showed and has to be analysed: for example, while UWB has a high performances in terms of accuracy, in sharp contrast to this, it also has medium power consumption. In the new IOT world, where power consumption is a key factor, BLE is for sure one of the best technologies that have to be considered. In addition the natural presence of Bluetooth Low Energy in many devices as smartphones, tablets and pc, allow a high accessibility to it. 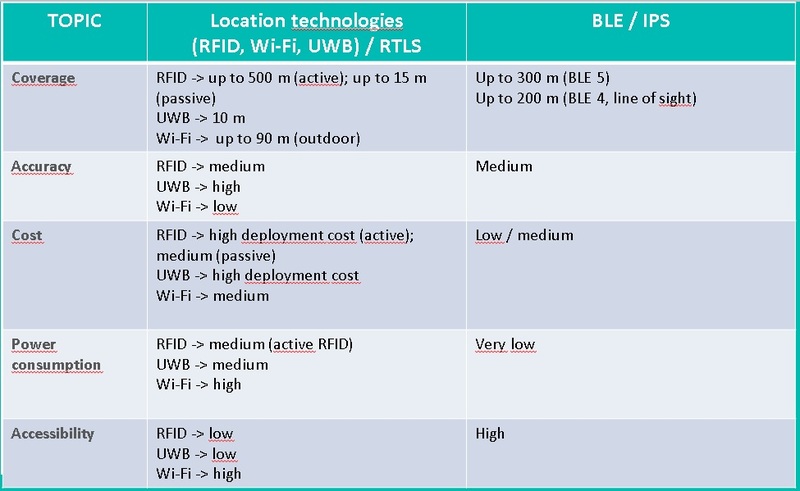 Overall, BLE is a perfect compromise between distance coverage, consumption, accuracy, accessibility and costs. That is why BLE can be used in many scenarios, with the minimum installation efforts and with costs for users affordable. On the one hand, our BLE based localization is not supposed to be accurate as the one implemented by using GPS or other expensive technologies, but on other hand it’s still absolutely useful, feasible and achievable. With BluEpyc Bluetooth Real Time Location – Zone Method is possible in fact to know the real time position within a defined zone, of an item or person with a reasonable accuracy. 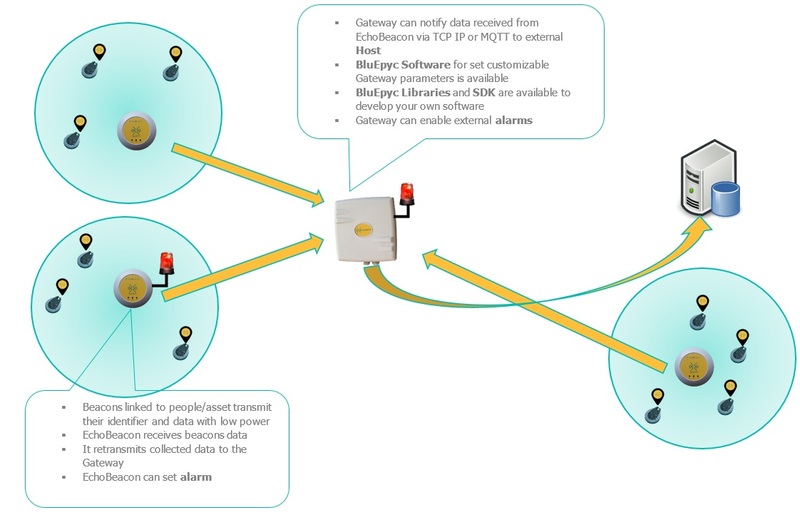 In a typical scenario, beacon is logically linked to a person/asset that have to be monitored; beacon transmits periodically a packet which contains its unique MAC Address. Furthermore, beacons transmit with a low power in order to be detected by only one BluEpyc EchoBeacon. In this way, the zone monitored from the EchoBeacon depends on the transmission power of the beacons and on the RSSI filter set in each EchoBeacon. 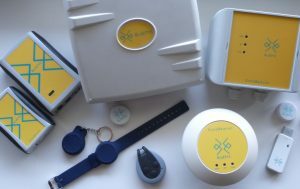 Once the EchoBeacon detects the information coming from its surrounding beacons, it forwards this information to the BluEpyc BLE Gateway using BLE packets. The BluEpyc Gateway is a device able to communicate to an external host in different way (Ethernet/Wi-Fi/ GPRS). Our BluEpyc Software is available in order to have a visual feedback (on a terminal) of the data that are handled from the Gateway and EchoBeacon. Software is useful also to set all the customizable parameters on Gateway and EchoBeacon. Lastly, should you need to develop your own application for your platform, we also distribute the BluEpyc Libraries and SDK.